Another knitting stitch in the found poetry of knitting stitches is "Wings of the Swan." 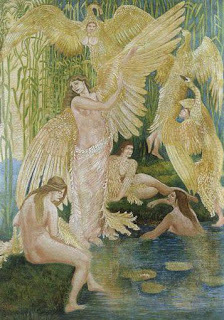 Swans, as you can see by an earlier post, figure prominently in the Arts. Perhaps it's their aesthetic appearance - beautiful white feathers, graceful long necks, regal bearing, elegant carriage - that make them the perfect model for works such as, Swan Lake (ballet), The Wild Swans at Coole (poem), Swan Maidens by Walter Crane, below. Then again maybe its their beautiful black eyes caught behind that mysterious mask that makes them so appealing. Whatever it is; it is not difficult to imagine a swan as a god in disguise. The knitting stitch "Wings of the Swan" is also very elegant. It's large and symmetrical with a suggestion of those mysterious eyes. 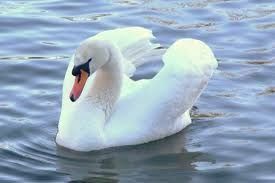 I have been scouring the Toronto waterfront for pictures of swans. They are rare, perhaps this is what makes them special. I could have taken dozens of pictures of Canada Geese - but swans - not so much. So I have caved in and borrowed this picture from Google images, just to move the blog along. 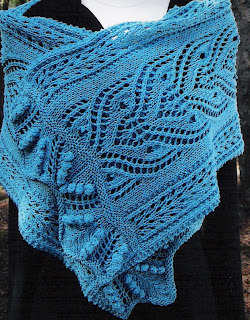 Wings of the swan is an exquisite stitch. It's on my to do list.